If I should need to move, I can be pretty sure of renting or purchasing a housing in an area which I can afford and in which I would want to live. Did parts of this conversation make you laugh? What did they discuss that you didn't understand? With what did you disagree? With what did you agree? At any point did you find yourself saying, "hmmm... I hadn't thought about that before now." Explain. III. Next, ponder this visual text by artist George Longfish called "Who's Gonna Ride Your Wild Horses?" Use the suggestions below to further your thinking as you make meaning of Longfish's text. What do you recognize? Describe why it is familiar and the context in which you understand it. What confuses you? Ask questions about those elements of the text. Think visually: what choices has the artist made about color? positive and negative space? composition (placement of each element)? To what part of the text are you drawn? Why? Do you have an emotional reaction to the text? Is it alarming? funny? sad? etc. Explain your reaction. IV. 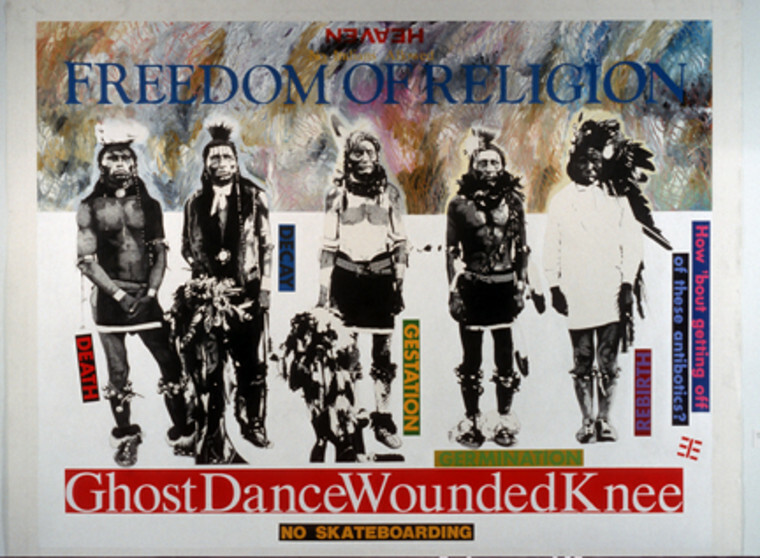 According to an art critic this piece "affirm[s] the creative survival of Indigenous consciousness, offer[s] insights into the concerns of a Native perspective and shatter[s] many of the stereotypes associated with Indians." Longfish is "critically engaged with the problem of decolonization." His work is "concerned with discerning truth from lies, the acknowledgement of spirit and memory, communication and dialogue — often expressed with humor and irony." In this work can you find evidence of each element of this criticism? V. You will each be given a section of a mural on which you will create your own visual text in response to the list of attributes in Part 1 of this exercise. Consider what your message is; what will an art critic say is the value of your piece? Longfish used so many techniques and artistic conventions to convey his purpose. Purposefully choose the means by which you will communicate yours. Once you have completed your section, you will be invited to comment on the sections created by your classmates so that the mural becomes a dialogue about race, place and cultural identity much like the spoken dialogue between Stewart and Stevenson. Consider this work to be a visual "they say... I say" exercise. What words can you include to push your viewer to think about your idea? What current events will you reference? How will you use line and color to further your purpose?